One of the rarest of the rare is going under the hammer at Christie’s June 21, 2017 sale of “Rare Watches and American Icons” in New York City. Lot 216 comes from a collector who commissioned this extreme rarity: a timepiece by A.H.C.I. watchmaker Christian Klings. Dresden-born Klings has been repairing clocks and watches since childhood, training in restoration like so many of his independent colleagues. After spending a few years in California, Klings moved to Heidelberg and then to Wechselburg, a village about 100 kilometers away from Dresden, where he now resides. Klings, who works alone without employees or apprentices, specializes in thinking outside the box when it comes to escapements. One of his recent achievements includes the Desmodromic escapement, which he taught himself to make upon the request of a Ducati-loving customer. A one-year development and four prototypes later, Klings was satisfied with the outcome that features a balance receiving an energy push only every other oscillation (as compared to every half-beat in the typical Swiss lever escapement generally in use today). He generally makes practically the whole watch, too, including the crown, dial, case, and movement parts. At the moment, the self-taught Klings only creates one unique piece wristwatch per year. 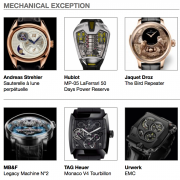 And when he’s done making one of his highly specialized wristwatches, he sees no need to reproduce it. He had, at one point, promised his fan base a small series, but this never came to pass. In his entire career, Klings has produced only about 20 wristwatches. And I don’t need to tell you that it is virtually impossible to just come across one of these. You either commission them or you hope one comes up at auction. But until now the latter has never happened. The Klings watch in the Christie’s auction was a commissioned unique piece, which took Klings approximately 18 months to complete. 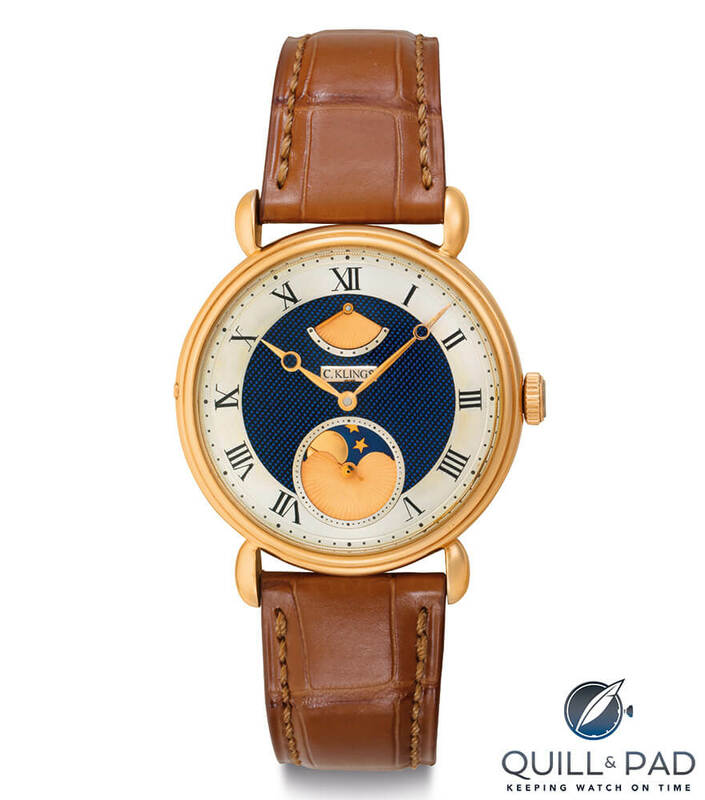 True to his own style, he worked from his handmade drawings – Klings does not use computers in his work – which provides a lot of explanation as to why, despite being completed in 2010, this watch looks so vintage in style. This pink gold watch has a distinct 1940s style with its stepped bezel and truly delightful teardrop-shaped lugs. And the gold Breguet-style hands contrast beautifully with the blue, silver, and gold dial. Part of the commission also included a quick-set function for the moon phase at 7 o’clock on the case. The moon phase features a handmade gold moon surrounded by stars. The moon phase disk is unusually crafted using hardened steel: Klings heated it up, let it slowly cool off, then used a stamping tool he made to mill out the shape of the stars before drilling holes inside them. “Because of the holes, the material can ‘escape’ and the stars are deep enough without deforming the disk,” Klings told the commissioning collector. Then he milled a recess for the moon and turned it on a lathe before hardening the moon disk using extreme heat and oil quenching. He then heated it to make it blue by tempering. The last step was applying the moon. The main blue color on any Klings dial is actually high-quality silk that has been “melted” onto the dial blank – leaving it with a texture that looks like guilloché, but softer. “It looks mellow,” Klings told the commissioning collector. The movement, made with no off-the-rack parts except for a few components re-worked from a vintage AS 1130 caliber (evidenced by the word “Swiss” engraved into one of the bridges), is very finely finished and topped off with a gorgeous frosted finish. It includes a free-sprung balance with regulating screws. The movement also boasts a unique space-saving winding mechanism using planetary gears going through the mainspring arbor fitted on top of the ratchet wheel. For more on Christian Klings, please visit www.christianklings.com and to see the auction piece visit www.christies.com/Lotfinder. Thanks so much for featuring Christian Klings. I learned about him a few years ago surfing the archives of PuristPro and have been fascinated by him ever since. I absolutely love his work and only wish he would make himself a teensy bit more visible. I am positive the $20,000-40,000 auction estimate will be blown away. Thanks for reading, Brandon. I certainly hope that estimate will be blown away – it really deserves to be!